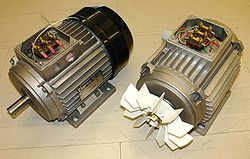 Three-phase totally enclosed fan-cuiled (TEFC) induction motor wi end cover on the left, an wioot end cover tae shaw cuiling fan. In TEFC motors, interior losses are dissipatit indirectly throu enclosur fins maistly bi forced air convection. An induction or asynchronous motor is an AC electric motor in which the electric current in the rotor needit tae produce torque is obtained bi electromagnetic induction frae the magnetic field o the stator windin. This page wis last eeditit on 8 September 2015, at 00:16.